For over 125 years, A. A. Will Corporation has excelled in all phases of heavy and civil construction. As the oldest family operated construction company in the greater Boston area, we understand the importance of providing consistent quality while adapting to changing times and conditions. 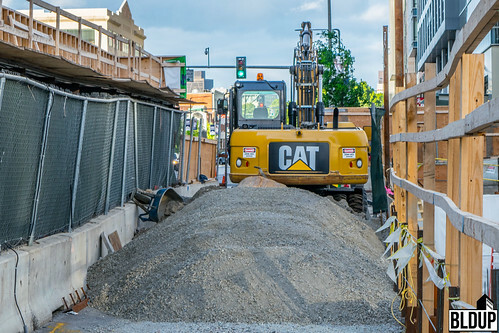 Whether it be up down construction, roadway construction, or another specialty area, we’re able to provide our clients full service from conceptual design budgets to final completion of a project. With completion expected this spring interior finishing is wrapping up for the 106 luxury condo homes at Pier 4 Phase II. Each waterfront residence features an expansive private balcony with direct water views along with custom designer finishes. Resident amenities will include white-glove concierge service, fitness center, resident lounge, and golf simulation room. A farm to table restaurant from notable culinary mind Kristin Canty will be located on the first floor of the project. 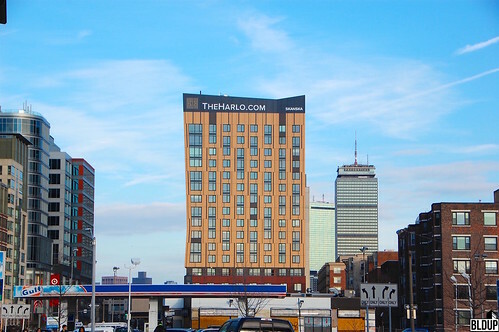 The Harlo, located in the Fenway neighborhood of Boston has been acquired by Invesco Real Estate for $150,025,000. New 17-story mixed-use building featuring 212 luxurious apartment residences and approximately 7,000 square feet of ground-floor retail space with premium dining options including Tatte Bakery, Oath Pizza and Cava Mediterranean Grill. Residences at The Harlo range from studios to three-bedrooms and feature elegant finishes including exposed concrete ceilings; quartz countertops; hardwood floors; oversized windows; and panoramic views of Fenway Park, the Charles River, and Downtown Boston. Select residences feature loft floor plans, as well as private terraces. The property at 130-140 Northern Avenue in Boston's Seaport District has been refinanced for $230.4 million via American General Life Insurance, Variable Annuity Life Insurance, and National Union Fire Insurance Company of Pittsburgh. Tishman Speyer's $500 million Pier 4 development project overlooking Boston Harbor features two buildings. A 13-story office building containing 353,000 square feet of office space with 20,000 square feet of ground-floor retail that was sold to Commonwealth Partners in August 2018. 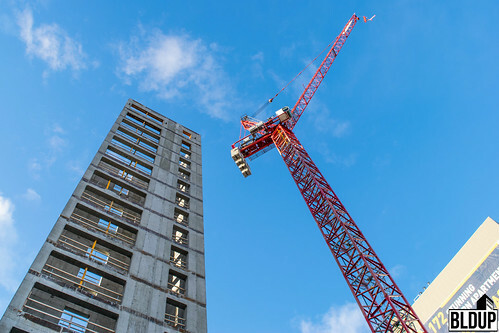 The nine-story residential building containing 106 luxurious one-to-four-bedroom condominiums with 17,000 square feet of ground-floor retail is still under construction. A total of 37,000 square feet of ground-floor retail will be located at Pier 4. Both buildings will feature rooftop terraces and state-of-the-art amenities. Pier 4 will include a one-acre public waterfront park. A two-level underground parking garage will be located on site. 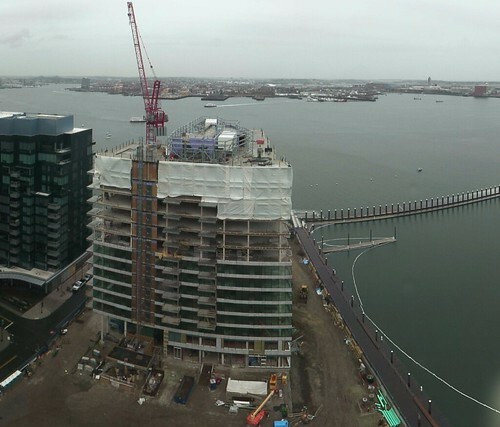 Construction continues on the upcoming luxury condos at Pier 4 in Boston's Seaport. The 9 story building will feature 106 residences and 17,000 square feet of ground-floor retail. Resident amenities will include an exclusive residents club, an outdoor terrace with a fire pit, and state of the art fitness center. Units are on sale now with an expected opening in early 2019. 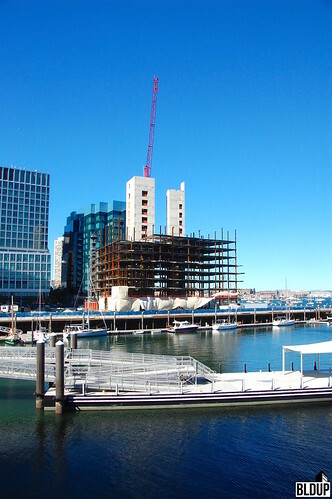 Work continues on the condominium building at the Pier 4 development in the Seaport. The 9 story building will feature 106 luxury condos ranging from 1 to 4 bedrooms all with their own private outdoor space. The ground floor of the project will house a 140 seat farm-to-table restaurant. Pre-sale has already kicked off with expected completion in the 1st quarter of 2019. The Harlo, a new 17-story mixed-use building featuring 212 luxurious apartment residences and approximately 7,000 square feet of ground-floor retail space with premium dining options remains one of the hottest apartment buildings in the city. An ideal Fenway location, an absurd amount of amenities, and reasonable rental rates make this multi-family dwelling one of the most sought-after in Boston. Apartments start at around $2,500 a month and increasingly grow more expensive relative to square-footage. With Multiple private outdoor spaces at The Harlo, including a yoga terrace; a fifth-floor outdoor terrace featuring cabanas, a fire pit and grills; and a top-level skydeck it makes sense that Bostonians are eagerly looking to call 1350 Boylston Street home. The Harlo opened this past fall (2017) and the project remained on schedule using Touchplan, a construction software that allows developers to plan, implement, and monitor projects in their entirety. The innovative software gives developers the ability to see the full spectrum of their project down to every last detail. Touchplan has let developers keep their projects on or ahead of time leading to lower costs and more efficient construction. Construction of the luxury condo building on Fan Pier is now complete. 50 Liberty features breathtaking views of Boston Harbor and the Downtown Boston skyline. Residents are situated at the heart of Boston's most innovative neighborhood, the Seaport District, steps to multiple dining and entertainment options. Residential amenities include top luxury finishes, floor-to-ceiling glass window walls, warm wood floors and high ceilings throughout. Building amenities will include a private waterfront club room, a boardroom for meetings, a private gym, 24-hour concierge service and underground garage parking. Luxury condominiums at 50 Liberty are now on sale. Visit 50Liberty.com for more information. Local bakery and cafe Tatte will open its’ next location at the $500 million Pier 4 waterfront mixed-use development in the Seaport District. Tatte’s new location will be located on the ground floor of Pier 4’s 13-story office building, which will include tenants such as Boston Consulting Group and Cengage, and will be over 3,600 square feet in size. Tatte recently opened its’ seventh location on the ground floor of The Harlo, a newly opened 17-story luxury apartment tower in the Fenway, and its’ eighth location on the ground floor of the 399 Boylston Street office building in the Back Bay. “Pier 4’s unbeatable location was a natural fit for us, and we look forward to opening our Seaport location in what will be a slice of green heaven on the water in the Seaport,” said Tatte founder Tzurit Or in a prepared statement. “I’ve watched the Seaport and Fort Point neighborhoods evolve into one of Boston’s most visited culinary destinations, and the Tatte team is thrilled to share a home base with some of the area’s top chefs.” Pier 4 will also be home to the Seaport District’s first farm-to-table restaurant, which is expected to open in 2019 and will be located on the ground floor of Pier 4’s nine-story waterfront condominium building. The restaurant will be operated by Kristin Canty, owner of organic, farm-to-table Concord, MA restaurant Woods Hill Table. Global education and technology company Cengage will relocate its’ headquarters to 117,000 square feet at Pier 4, a mixed-use Seaport District development overlooking Boston Harbor opening this Fall. Cengage’s office will be located across the second through sixth floors of Pier 4’s 13-story, 373,000-square-foot office building, with a private outdoor terrace on the fourth floor. 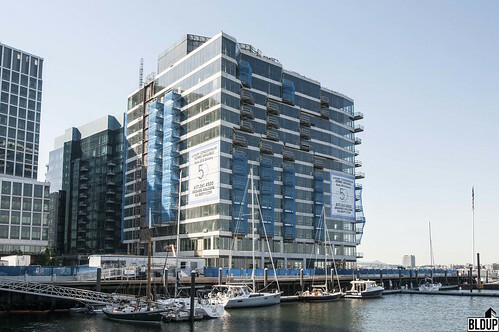 With Cengage’s lease, the Pier 4 office building is nearly fully leased. The building will be anchored by Boston Consulting Group, who will open a new 202,000-square-foot headquarters across the top seven floors. In total, the building features 353,000 square feet of office space and 20,000 square feet of retail. Amenities will include a state-of-the art fitness center, bicycle storage and three levels of parking, with a new public Harborwalk and one-acre waterfront park. The $500 million Pier 4 will also feature a nine-story condominium building with 106 residences now on sale and 17,000 square feet of ground-floor retail. The Seaport District’s first farm-to-table restaurant will open on the ground floor of the upcoming Pier 4 waterfront condominium building. The restaurant will be operated by Kristin Canty, owner of organic, farm-to-table Concord, MA restaurant Woods Hill Table, and will have 140 seats, including a raw bar, along with a 40-seat patio. Like Woods Hill Table, food will be sourced directly from The Farm at Woods Hill, Canty’s Bath, New Hampshire-based farm. Canty hopes to decorate the restaurant, which has yet to be named, with items sourced from the former Anthony’s Pier 4 restaurant, which closed in 2015 and was demolished in 2016 to make way for the condominium building. The $500 million Pier 4 development, which is expected to open in Fall 2018, will feature two buildings with sweeping views of the Boston skyline and Boston Harbor. The nine-story condominium building will feature 106 residences now on sale and 17,000 square feet of ground-floor retail. A 13-story commercial building will feature 353,000 square feet of office space, anchored by Boston Consulting Group’s new 202,000-square-foot headquarters across the top 7 floors, and 20,000 square feet of retail. Newly revealed renderings of Pier 4, including the condominium building's residences and multiple roof decks, are posted above. 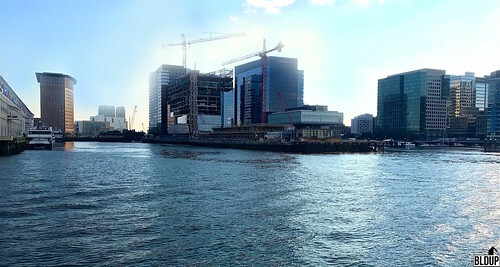 The Seaport District’s 13-story, 373,000-square-foot Pier 4 waterfront office building, which will be anchored by Boston Consulting Group, is nearly fully glassed in, with floor-to-ceiling glass curtain wall panels installed up to the building’s 10th floor. Pouring of concrete floors and fireproofing spraying are both just about complete inside the building. The Pier 4 office building will feature open floor plates with sweeping views of Boston Harbor. Boston Consulting Group has leased 202,000 square feet across the top 7 floors; expected occupancy is in Fall 2018. A total of 353,000 square feet of office space and 20,000 square feet of retail will be located at the Pier 4 office building; space is now available for lease. 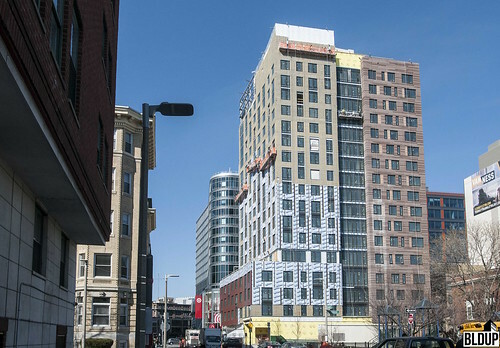 Skanska has taken the wraps off of The Harlo, a new luxury residential building featuring 212 studio to three-bedroom apartments opening this Fall at 1350 Boylston Street in the Fenway. The Harlo will feature an eclectic collection of today’s most desirable amenities, including a top-level sky deck with sweeping views; a fifth-floor terrace with barbecue stations, canopies and a fire pit; intimate lounges; and co-working and fitness spaces. Residences will feature elegant finishes including exposed concrete ceilings, quartz countertops and hardwood floors. The Harlo will be professionally managed by Bozzuto. On The Harlo’s first floor will be premium dining options including Tatte Bakery, Oath Pizza and Cava Mediterranean Grill. Additional information about The Harlo, including the latest building renderings, is posted above. 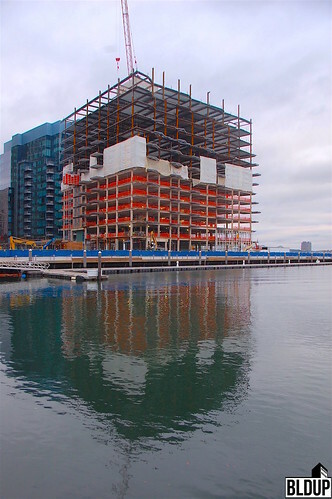 The first glass curtain wall panels have been installed along the lower levels of the recently-topped-off 13-story, 373,000-square-foot Pier 4 office building. The building will feature 353,000 square feet of Class A office space with floor-to-ceiling windows and open floor plates offering sweeping views of Boston Harbor. 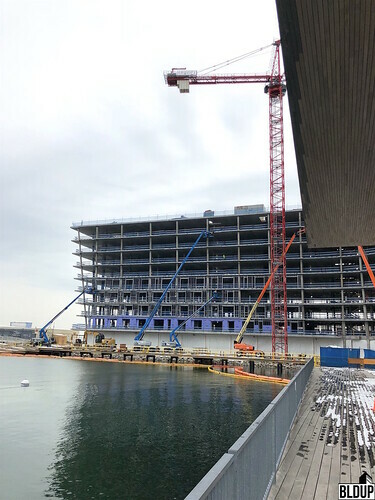 On the Pier 4 office building’s upper levels, concrete is being poured to construct floors and fireproofing is being sprayed along columns and ceilings. The Pier 4 office building will be anchored by Boston Consulting Group, who will occupy 202,000 square feet across the top 7 floors, with completion expected in Fall 2018. 20,000 square feet of ground-floor retail will be located along the Pier 4 office building’s ground floor. 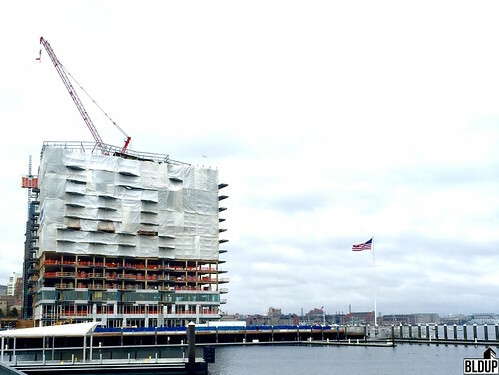 A topping-off ceremony was held this past Wednesday (June 7th, 2017) for the 13-story, 373,000-square-foot Pier 4 office building in the Seaport District. The ceremony marked the completion of construction of the building’s steel structural frame. Concrete pouring to construct the office building’s interior floors and interior fireproofing are both now underway, and facade finish installation has begun at the office building’s base. Tatte Bakery & Cafe has signed a lease to open a new location on the ground floor of the upcoming 1350 Boylston Street luxury residential tower, which will open this Fall in the Fenway. Tatte's new space will occupy approximately 2,900 square feet; 1350 Boylston Street will have 7,000 total square feet of retail. The space will feature handpicked lights and antique fixtures and will serve crafted confections and cuisine for breakfast, brunch, lunch and dinner, offering future building residents a convenient and luxurious dining option. The Fallon Company has listed several waterfront luxury condominiums at 50 Liberty in the Seaport District for sale. Condominiums listed range from a 1,297 square foot one-bedroom/two-bathroom unit with one garage parking space offered for $1,848,995 to a 3,573 square foot three-bedroom/three-bathroom penthouse unit with two garage parking spaces offered for $9,100,225. The latest details and renderings of 50 Liberty can be found above. 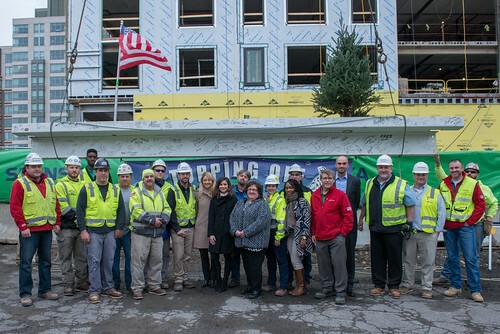 Skanska held a topping off ceremony for 1350 Boylston Street, a 17-story mixed-use tower in the Fenway, on Wednesday (November 16th, 2016). The ceremony marks completion of structural steel erection on 1350 Boylston. Work will now commence in earnest on exterior and interior finishing targeting a Fall 2017 opening. 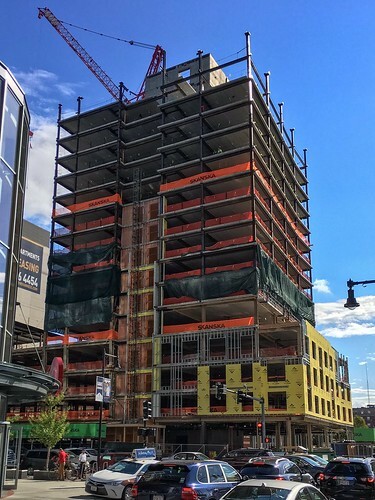 1350 Boylston Street’s concrete foundation is nearly complete, and the 18-story elevator core is finished. 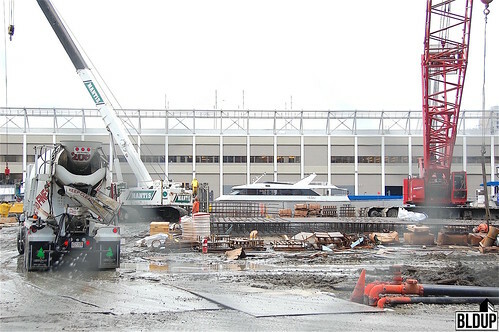 Concrete has been poured along the entire base of the 105-car underground parking structure. The horizontal foundation support system, used to reinforce the under-construction foundation, has been dismantled. 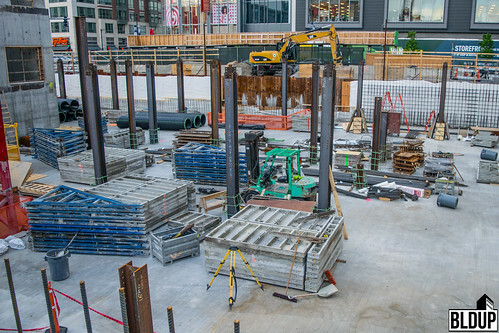 Steel forms are posted along the sides of the parking structure; concrete will soon be poured into these forms to complete 1350 Boylston Street’s foundation. 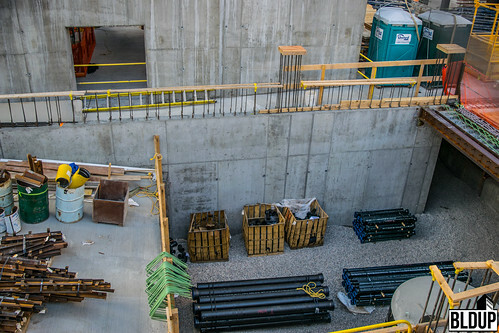 Additional concrete framing equipment is staged along the base, as well as cast iron pipes that will be used to construct the building’s drainage system. 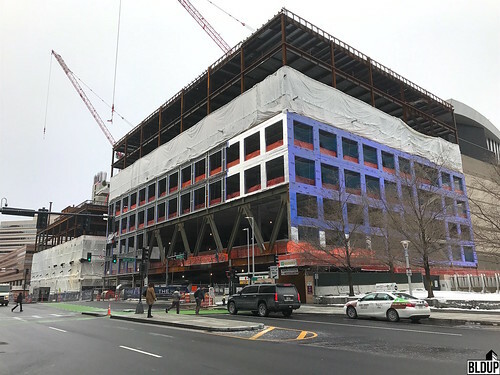 Superstructure construction at 1350 Boylston Street is off to a strong start; vertical steel girders are installed along nearly the entire parking structure’s base. 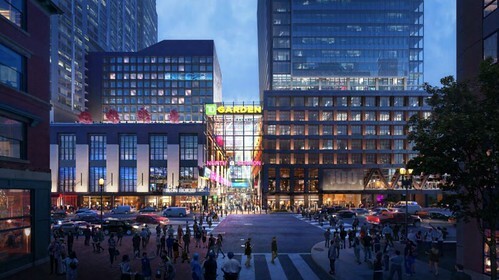 1350 Boylston Street will be a 17-story building that will feature 212 rental residential apartments and approximately 7,000 square feet of ground-floor retail space. More information about 1350 Boylson Street is posted below. 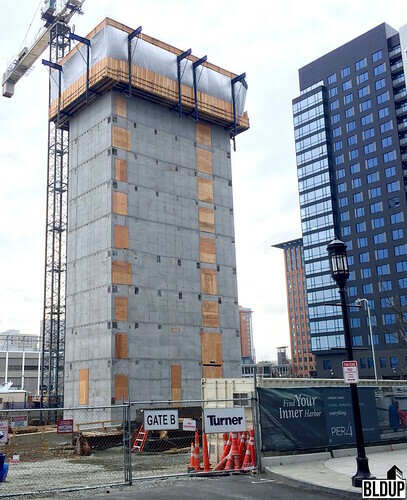 1350 Boylston Street's elevator core has topped off. 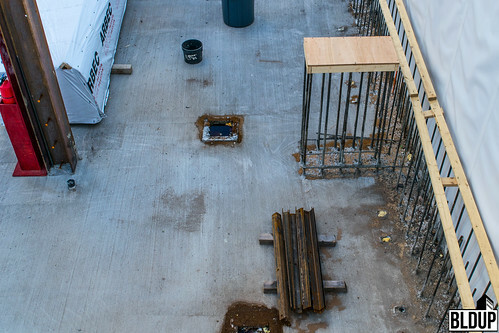 At the top of the elevator core is a decking system that was used to frame pouring of concrete to construct the core. 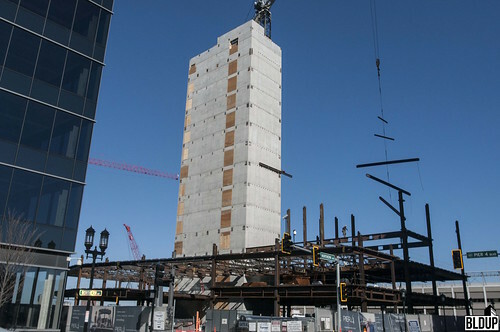 1350 Boylston Street's topped-off elevator core. Note decking at top of core. 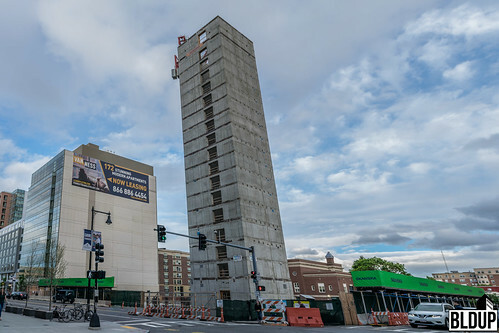 Construction of 1350 Boylston Street's 17-story steel superstructure has begun. The first pieces of superstructure steel have been installed at the building's base. 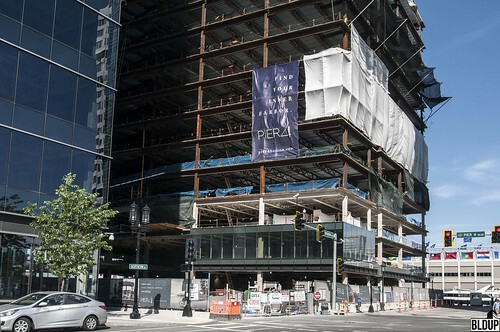 At the base of the parking structure, the construction team is assembling a PERI Skydeck system that will be used to frame pouring of concrete to construct 1350 Boylston Street's superstructure. 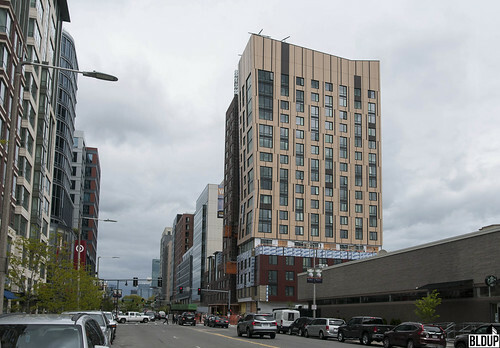 A similar system is being used to build Pierce Boston, a 30-story tower also under construction in the Fenway neighborhood. Concrete for 1350 Boylston Street's mat foundation has been poured at the base of the parking structure. Additional foundation concrete is now being poured vertically along the sheet pile wall. 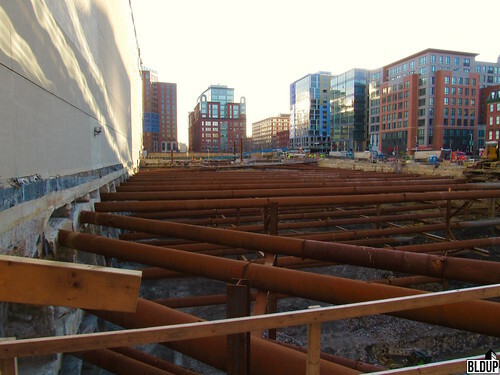 With foundation concrete poured and superstructure construction underway, 1350 Boylston Street's horizontial foundation support system will soon be dismantled. View of foundation concrete poured vertically along the sheet pile wall up to the horizontal foundation support system. Concrete will be poured along the entire sheet pile wall following dismantling of the support system. More information about 1350 Boylston Street is posted below. A tower crane has been installed at 1350 Boylston Street, signaling the impending start of elevator core and superstructure construction. 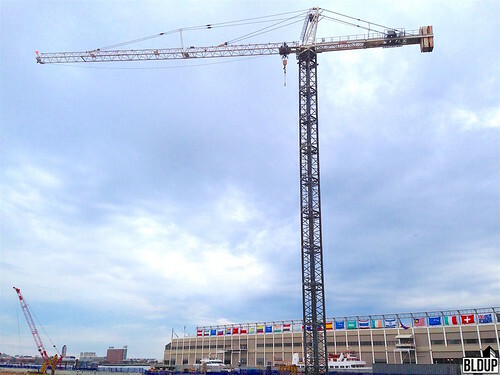 When we arrived at 1350 Boylston Street, tower crane installation had just been completed. The crane used to build the tower crane was parked on site. A second smaller white crane was also present, presumably to lift the excavators out of the nearly fully excavated parking structure. At right is the larger white crane used to build the tower crane. At left is the smaller white crane, which has presumably just lifted the yellow excavator beside it out of the parking structure. 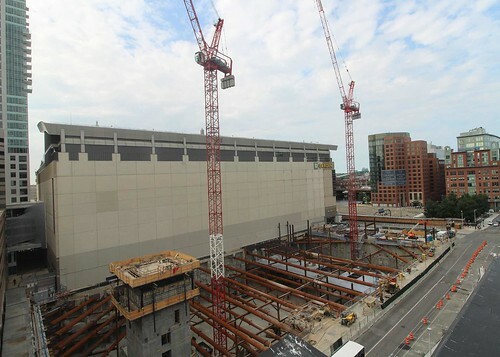 Excavation of 1350 Boylston Street's foundation and parking structure is almost complete. Foundation concrete will soon be poured along the sheet pile wall and the base of the parking structure. An excavator at the base of the nearly fully excavated foundation. Along the perimeter of the foundation is a sheet pile wall horizontally reinforced by a foundation support system. More renderings are posted on Tishman Speyer's Pier Four website. 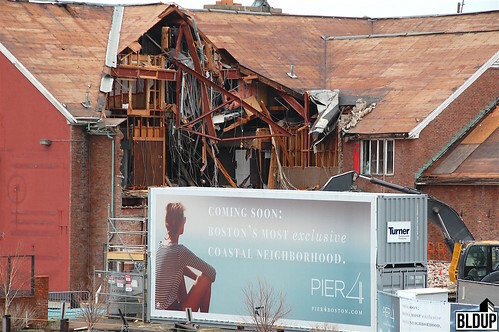 The Boston Herald also reports that the existing Anthony's Pier Four restaurant building on site will be demolished next week. A waterfront park and plaza will be built at the restaurant's current location. More information about the Pier Four project is posted below. Slurry wall foundation construction is beginning at Pier Four Phases Two and Three. Preparation for demolition of the former Anthony's Pier Four building on the Pier Four Phases Two and Three site has also begun. 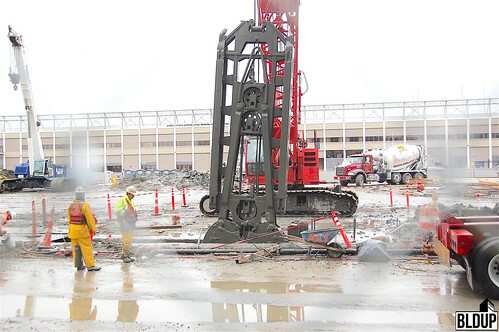 Excavation of the Phase Two office building's foundation and construction of the building's slurry wall is expected to take approximately eight months. Afterwards, the office building's mat foundation will be poured, a process that will last under a month. Adjacent to 100 Northern Avenue, new curbing and pavement have been installed as part of the Northern Avenue Straightening project. New photographs of the Northern Avenue Straightening project are posted above. Construction of 50 Liberty's slurry wall foundation is nearly complete. Final excavations are taking place, and concrete for the mat foundation is beginning to be poured. We are excited to watch 50 Liberty's frame begin to rise! 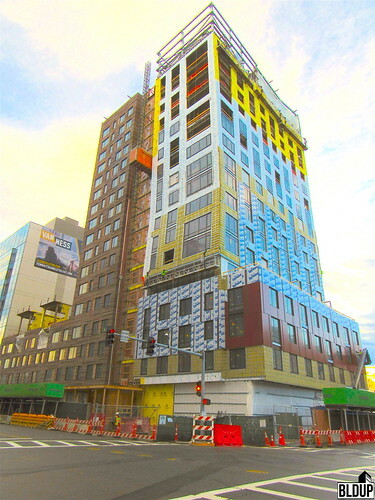 New photographs of 50 Liberty are posted above. 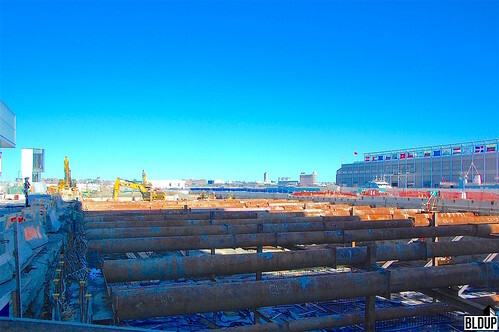 With pile driving completed, foundation work is moving forward at 50 Liberty in Boston's Seaport District! A. A. Will Corporation is hard at work digging 50 Liberty's future foundation and underground parking structure. We can't wait to watch the impending concrete pour! Pile driving is complete at 50 Liberty, and excavation of the building's slurry wall foundation is beginning. 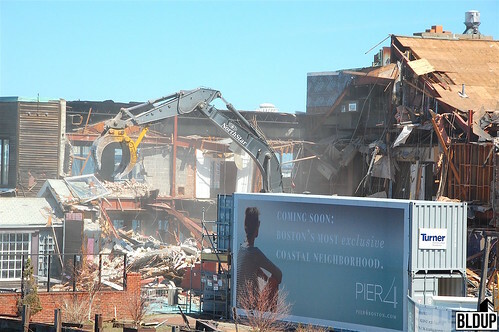 Initial site work has begun at Pier Four Phases Two and Three in Boston's Seaport District! The construction team is getting ready to break ground on a 373,000 square foot office building (Phase Two) and 100 luxurious waterfront condominiums (Phase Three). A. A. Will Corporation is performing initial earthwork in preparation for foundation construction. Electric contractor John A. Penney Company is installing an electrical system that will be used to power the busy construction site. Turner Construction Company is Pier Four Phases Two and Three's construction manager. Expected completion of Phase Two is in 2017, with Phase Three following in 2018. Foundation construction is underway at 1350 Boylston Street. The construction crew is currently excavating the building’s future basement and underground parking garage. 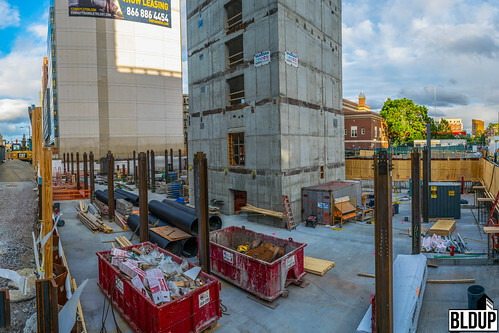 A sheet pile wall has been constructed along the perimeter of the 17-story building's foundation. An excavation support system has been installed horizontially across the foundation area to reinforce the completed sheet pile wall. Burger King has been demolished, and construction of the new 17-story building at 1350 Boylston Street will commence by the end of the month. Construction fencing has been installed surrounding the 1350 Boylston Street parcel, signaling the imminent demolition of the Burger King restaurant structure to make way for a new 17-story building. Pile driving progressing in earnest at 50 Liberty! New promotional signage has been installed along the Pier Four Phases Two and Three construction fencing. We look forward to the project's impending start of construction!